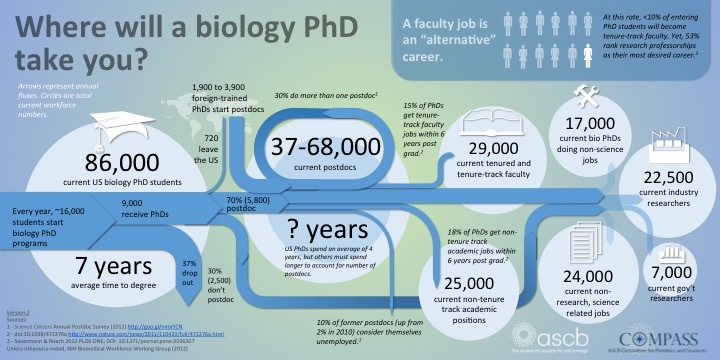 Where Will A Biology PhD Take You? Based primarily on the 2012 NIH Workforce report this infographic represents current workforce sizes and annual fluxes before and after a PhD in the biomedical sciences in the US. The picture is not as dire as that painted for the UK by this 2010 Royal Society report, but many of these figures are based on estimates and self-reporting. We’ll have to wait for the NAS Postdoc Report for better data. 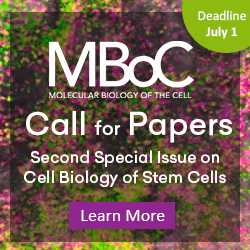 In the meantime, that report’s chair, Greg Petsko, has divulged some interesting tidbits in his iBiology talk: the data on postdocs are so poor, many institutions can’t estimate the number of postdocs they have within an order of magnitude. Hopefully, clear data on these job markets will empower trainees to make better-informed career decisions.